Hey guys, my name's Alex. I drive a 97 Honda Civic EX coupe. About 2 months ago I pulled two really stupid moves. I backed my car into a curb on the passenger side...twice. On separate days. Both times resulted in tears in my front and rear tires. Two months and 2000ish miles later, both tires are holding up fine, with no noticeable air loss. Posted are pictures of the tears, the ruler is for size reference. Neither tears are more than 2mm deep. 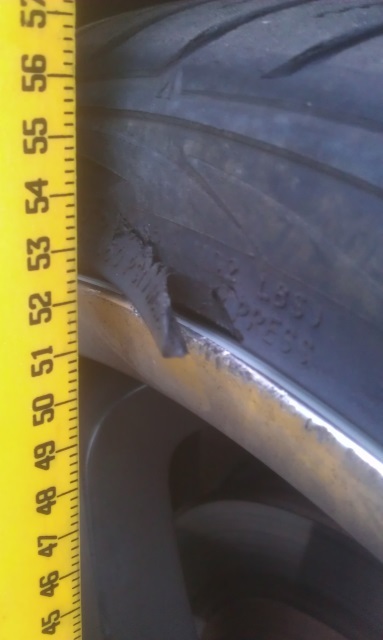 The front tire tear is deeper, but the rear tear has a slit to the right, as shown in the picture. 1. Do I need to replace the tires? Or should I be fine for another 6ish months? My fronts have about 50% tread left, but the rears are newer and have around 85% tread. 2. Is there a way I can repair the tears for purely cosmetic reasons? Such as a glue or some sort of adhesive just to make the tears much less noticeable. It pains me every time I see them, especially since I already feel incredibly stupid for curbing it twice. Size is 205 40 R17. Fronts are Toyos (not sure on model), rears are Delinte Thunder D7s. The Toyos are tubeless, radial, and reinforced, but not bi-directional I believe. The rears are tubeless, radial, and bi-directional, but I don't believe they are reinforced. Delinte is a discount brand, but considering I picked up the pair new for $100 and the tread is still immaculate after 3000 miles, I'm definitely impressed. Sorry for all the words, I like to talk. I appreciate any feedback, and thanks ahead of time. Left is rear, right is front. Last edited by Alex0856; 05-11-2013 at 02:27 PM. that is called a rim protector and is built onto the tire to help protect the wheel at the tires expense. It is only cosmetic nothing to worry about. Please help reduce our mini van population and wear condoms! 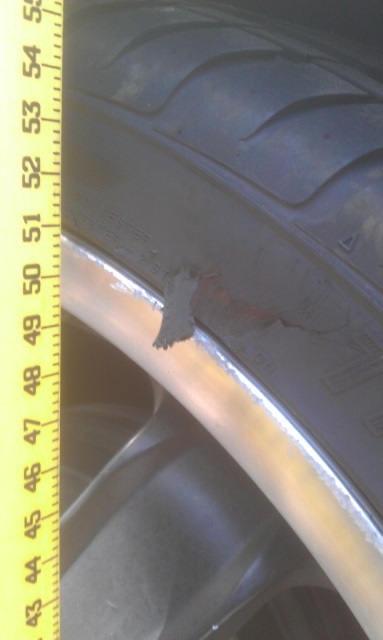 Shows what I know about tires haha. Alright, so if I just glued them back in or cut the hanging parts off I'd be good? grab it with your hand and tear it.